The Gardens Mall has always been a favorite of mine, simply because the crowd is manageable, we often find parking, the baby facilities were great and it's attached to MidValley Mall which allows access to almost anything you need. 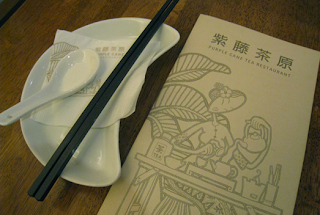 Often when we were there, we would have a meal at the basement where the very busy Din Tai Fung (Chinese restaurant that serves pork) would serve its world-famous Xiao Long Bao along with a host of other delicious dishes. Most of the Chinese who frequent the mall also have the same idea as myself -- so the place tends to get packed and busy, and sometimes the queue can be long! 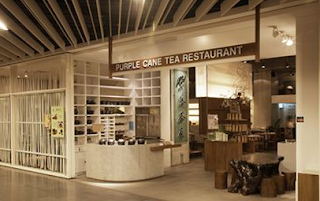 Because of that, as well as the introduction through a friend, we ventured to the neighboring restaurant called Purple Cane. And since I have set my chopsticks on those Abalone Mushroom, I was in love with the place! The abalone mushrooms are cooked perfectly (to my taste). Love the sweet-tangy sauce that comes with it and the way they have stir-fried it with some chili (which I don't eat, and it doesn't make the dish spicy at all). It's easy to turn vegetarian when I am in that restaurant, because the non-meat options are aplenty and tasty... so we would often visit this place when we are in Gardens. The service is usually good -- depending where you sit. There were times getting the the attention of waiters were a challenge, sometimes the food takes long, and certain times when everything is just perfect. Guess it depends on how busy they are. I would often order their tofu dishes. The one below is what I would always order... though yesterday (Saturday Aug 31, 2013 Merdeka day), we tried a different tofu dish. The one which I usually order is huge and comes with some sauce. There were a few times though they ran out of it when we visited. Just to note. The usual table set-up of Purple Cane would be the moon-shaped plate with a chopstick and a soup spoon. This is their menu. They also provide baby chairs and baby table settings. One of the let-down and disappointing dish at Purple Cane would be their duck wrap. We ordered this one time long ago, and it was so, so dry and tough. I spoke to the manager that time and they allowed us to cancel the dish. I suggest that if you want some serious duck rolls, go somewhere else because their version might not suit you. Not good at Purple Cane - duck wrap dish, skip it! After one bad experience, we never ordered it again. 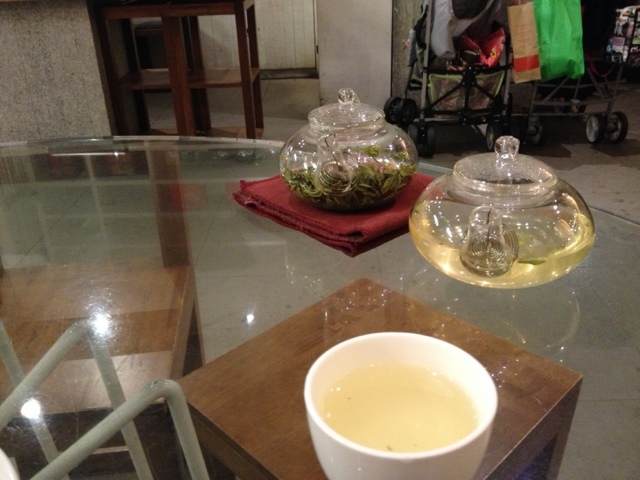 Hubby wanted something warm so he ordered one of their specialty teas which was about RM13 per pot. It was good and the waiters are usually very attentive in refilling the hot water and transferring it to another pot so your tea will not turn bitter. 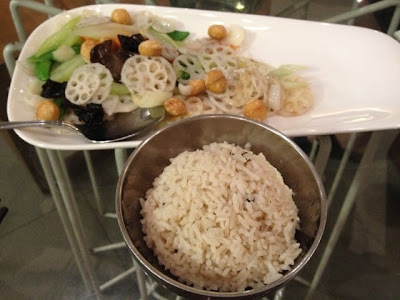 We wanted to try a new vegetable dish which we didn't order before, so we opted for the lotus root with macadamia nuts and celery. It was pretty good and we were satisfied with our order. 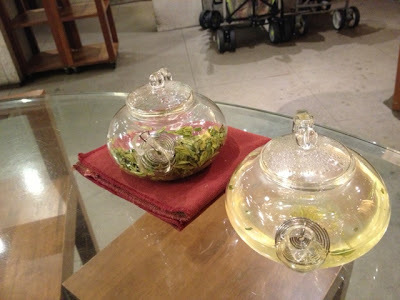 We would also often take the green tea infused rice together with the dishes. 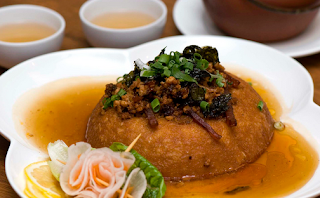 The must-eat dish for me is the Abalone Mushrooms which are stir-fried with onions and chili. This is an absolute must for anyone who goes there (in my opinion). I love the way the sauce taste and how my little daughter mistook the mushrooms for "chicken" at some point in time. When we brought some kids to this restaurant, they all liked this dish and would eat it with the rice happily. One way to get them to eat mushrooms! 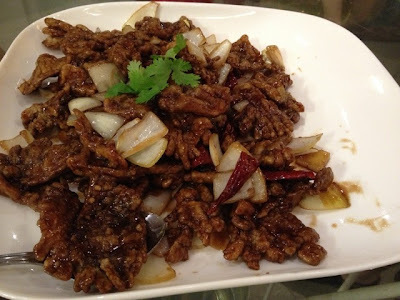 Abalone mushrooms stir-fried with Chili and Onions -- a must try dish! 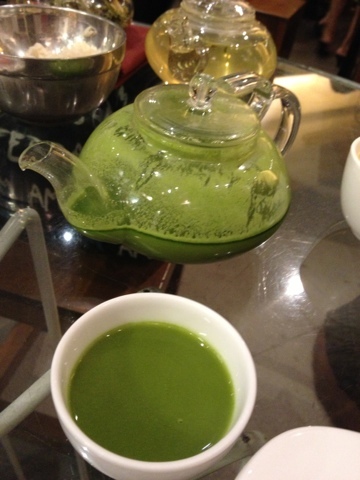 Another favorite of ours, including my 3-year old daughter would be the lei cha soup, which is a greenish soup that is served in a teapot. Then they would give out small, little cute cups where you can pour out the hot soup. My daughter would look for it and say Mama where is the green soup? Lei Cha Tea Soup - nice and must try this too! 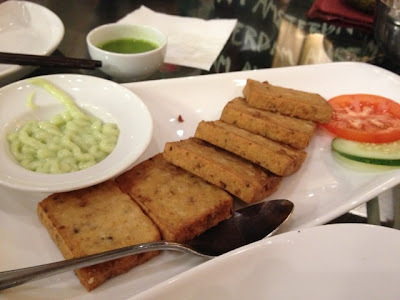 We decided to try another tofu dish apart from our usual one (the tofu withs sauce). The waitress suggested we try the fried tofu which has a mix of a bit of shrimp and comes with a mayonnaise sauce. It was okay -- tasty and you could really tell there are some shrimp taste inside. 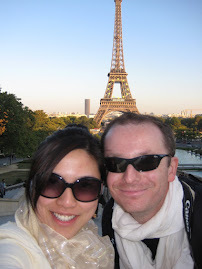 I am still more partial towards our usual tofu dish and will revert to the usual when we do go back again. 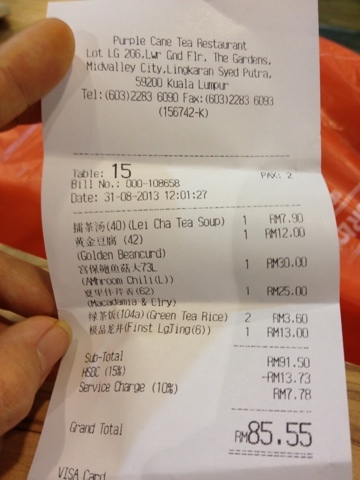 Bill for 3 adults and 1 toddler came up to about RM 85.55. Take note we were on a carb-diet and didn't want to eat a lot of rice, so we shared only 2 cups of rice. 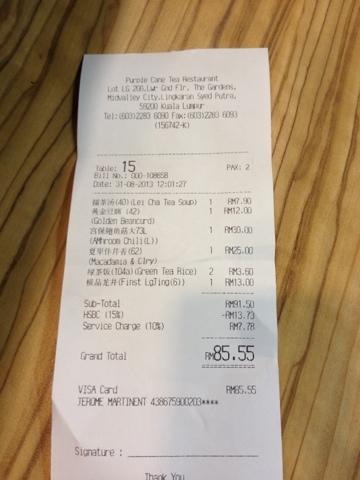 Plus, we have the Gardens Club card / HSBC credit card which gives you a discount for a la carte items. Love this place as they often have discount for both cards that we have... but if you take lunch sets of course that is already a good deal and won't have discount anymore.